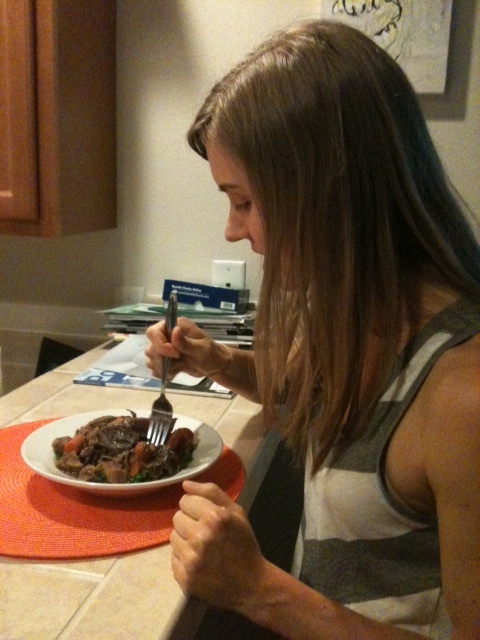 I finally tried some beef…no big deal! I recently indulged my curiosity with beef and you know what? I am 100% fine! I was a little scared to try it after so long and truthfully, I never much cared for beef even when I did eat it. 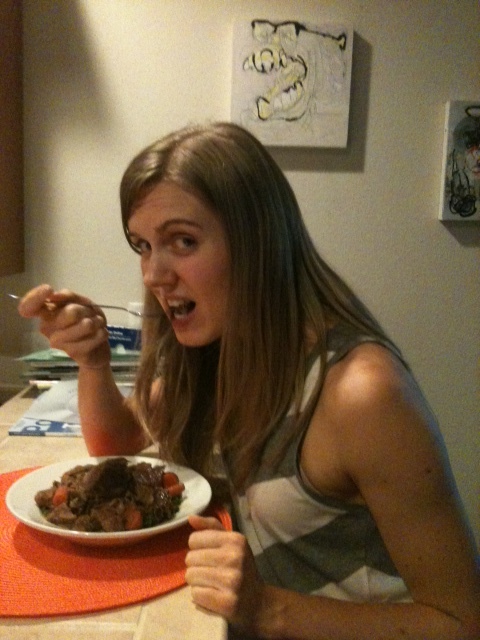 However, I do remember liking stew meat, so that’s what I went with. By surprise and on my own (I didn’t tell Jesse), I picked up two packages of grass-fed beef stew meat at the store, along with the remaining ingredients to make Everyday Paleo’s red curry beef stew. I made one modification — I subbed carrot chunks for the yams since I’m not able to eat potatoes of any sort since I’m currently adhering to the SCD. The stew smelled so good while it was cooking! Once it was ready, and after a little hesitation, I finally took a bite. Guess what? I liked it! I admit, it was a little strange though and definitely a forgotten texture. Jesse was very surprised by my meal and got a real kick out of me trying it. I tried not to dwell or over think what I was eating. Bless it, accept it, eat it and carry its essence within. One thing to note, the red curry flavor was hardly evident, so I will definitely double it the next time around. It may even need more than double. It’s funny though because in the recipe book, the caption says that the meat really takes on the red curry flavor and to even use less if you don’t like it too spicy. I used the recommended amount, but there was seriously no spice at all. Yes, it was still delicious and enjoyable, but had I not made it, I would’ve never guessed there was red curry paste in there. Place stew meat into a slow cooker and add the red curry paste. Mix well until the meat is coated with the paste. Pour in the coconut milk and chicken broth, and mix well. Top with the carrot pieces and cabbage. 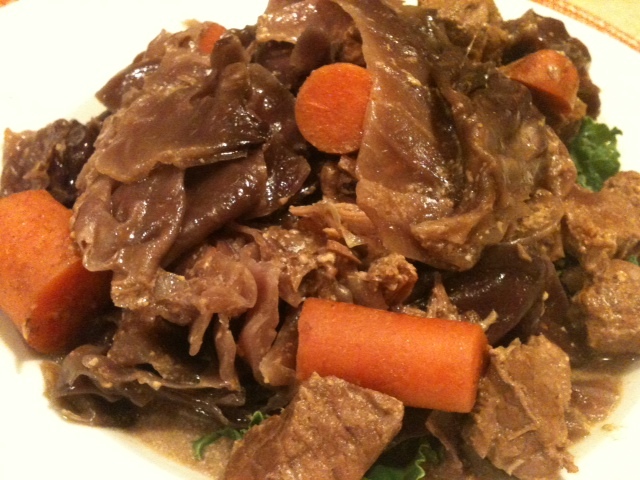 Cover and cook on low for 6-8 hours or until the stew meat is tender and falling apart and the carrots are soft. Steam the kale for 2-3 minutes. Serve the stew on top of a bed of kale or other veggie of choice. Why wouldn’t you eat beef? I stopped after that mad cow was delivered to Portland supermarkets! 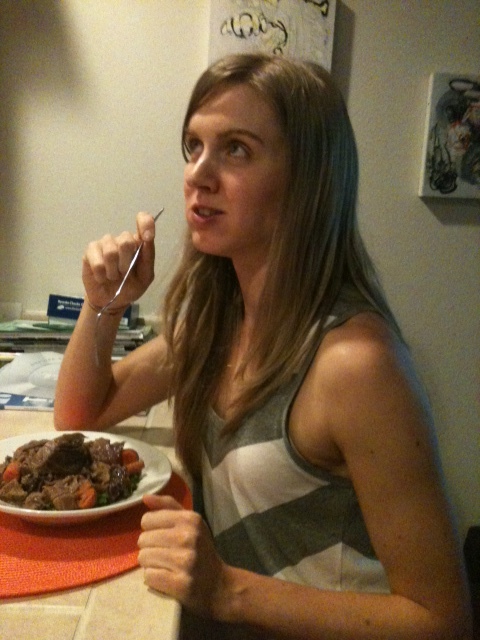 I didn’t eat beef for about six years before I went paleo (this is Rachel), but now I feel much more comfortable especially with locally-raised or even grass-fed beef. Looks yummy! Hi Rachel! I don’t know if you read my ‘About’ section, but until this past November, I hadn’t eaten meat in about 10 years and even longer with red meat. At this time, I started eating chicken and turkey, along with some fish, but that was it. I was scared to eat larger animals and I’m a total softie. Cows have those big, sad eyes that make my heart melt and I felt too bad to eat beef. Obviously, I’ve come to terms with it a bit more now and try not to over-think it. I realize, I can respect and have compassion toward animals while still choosing to consume them. Like you, I only choose high quality beef. I refuse the eat the other stuff. Oh, and it was yummy!